Longevity, it seems, is no longer a sure guarantee of a restaurant's quality in New York City. 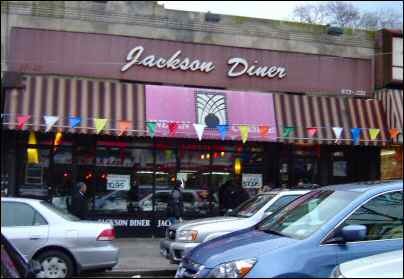 Jackson Diner on 74th St in Jackson Heights has been around for what seems like a gazillion years. Yet what was dished out the other day at Jackson Diner was such mediocre fare that I lamented the restaurant's survival through this terrible recession. My recent visit to Jackson Heights was intended to pick up some Indian grocery and vegetables at Patel Brothers when suddenly the craving for Indian food overtook me. Without much ado, I popped into Jackson Diner, the granddaddy of Indian restaurants in Jackson Heights, if not in all of Queens. Since it was lunch time, I opted for the Buffet priced at $10.95. Jackson Diner Lunch buffet during my visit included standard Indian fixtures like Alu Tikki, Papdi, Channa Masala, Tandoori Chicken, Goat Curry, Keema, Mutter, Chicken Makhani, Naan bread, plain Rice, Tandoori Vegetables, Saag Paneer, Vegetable Korma, Curry Pakora, Masala Dosa and Rice Pudding. That's not a lavish offering. Hey, where's the Indian-Chinese stuff? 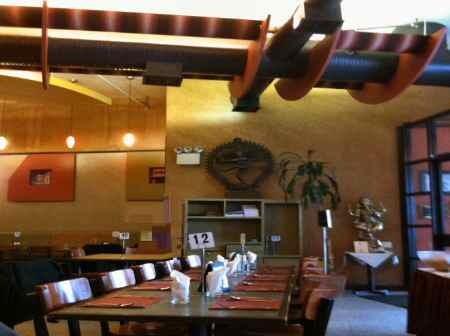 For the same price of $10.95 or less, some Indian restaurants on 74th St that I have favored with my presence included three appetizers, three desserts, one Biryani, Hakka Noodles besides Masala dosa and an array of vegetarian and non-veg entrees. Alu Tikki was slightly saltish, rubbery and lukewarm. The accompanying Channa Masala did not provide much relief as it was way too underspiced. Mercifully, Green Chutney was at room temperature and tasty. Papdi was crisp but best enjoyed in the form of Papdi Chaat rather than a plain one. 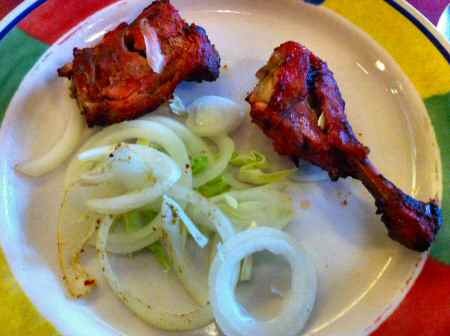 Tandoori Chicken was mildly marinated grilled meat that easily slipped into the mediocre category. Rare is the Indian restaurant in New York City that turns out a good Tandoori Chicken these days. If I've said it once, I've said it a million times - Schmucks, pay more attention to the marination of the chicken. Kheema Mutter was a grossly underspiced gravy travesty that yielded little joy. It never ceases to amaze me that a lot of Indian restaurants serve such underspiced fare to diners, making a mockery of Indian cuisine. Chicken Makhani was all right but nothing to send me into raptures. Like the meat items that I tried, my vegetarian choices too yielded little comfort at Jackson Diner. The mildly spiced Saag Panner mercifully did not suffer from the commonplace raw spinach flavor at a lot of Indian restaurants. But the Paneer cubes were a little hard. 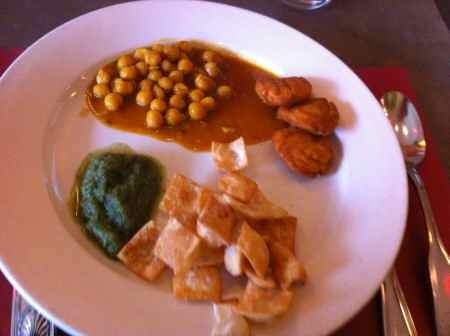 Set in a brown color medium thick gravy, Vegetable Korma included Potato, Snowpeas, Green Peas and Carrot. It was too moderately spiced to be called Korma. Korma is usually a spicy delight with a melange of vegetables. But Jackson Diner's version of Vegetable Korma while edible was not in the least bit spicy. 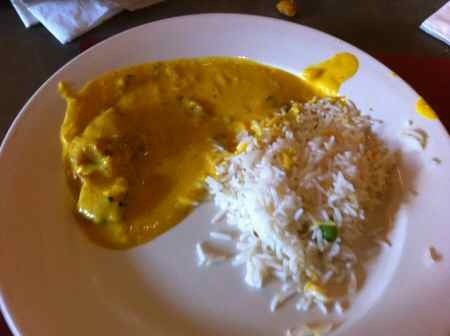 Yet another disappointment at Jackson Diner came in the form of Kadhi Pakora. With overpowering taste of turmeric powder and tasteless pakora, Jackson Diner's Kadhi Pakora was a complete disappointment. A close competitor to the horrid Kadhi Pakora in terms of taste were the Tandoori Vegetables. 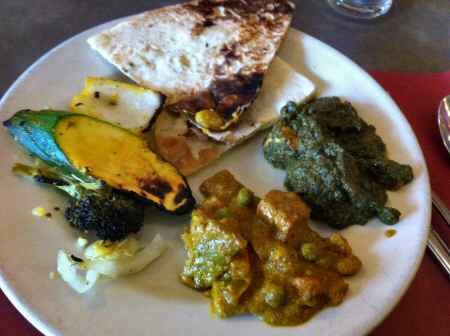 Tandoori Vegetables included Cucumber, Broccoli, Green Bellpepper and Onion. To put it in one word - Tandoori Vegetables were AWFUL with poor marination. Tandoori Vegetables are best when served fresh out of oven and with nice marination, and not dumped in a heap at the buffet station. Naan bread was rubbery and cold and I did not enjoy it one bit. Unlike other Indian restaurants on 74th St in Jackson Heights, Naan bread at Jackson Diner is dumped in heaps at buffet station. Classy Indian restaurants serve Naan bread hot at the table. By now, I was certain that by no stretch of imagination could Jackson Diner even remotely be considered a fine Indian restaurant. Plain rice was fresh and there were no issues with the texture. Masala Dosa was freshly prepared, served hot but burned badly in the middle. 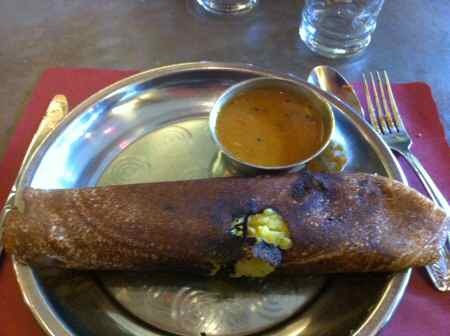 It included a generous amount of Potato filling but some portions of the Dosa were burnt badly. Coconut Chutney, a must with Masala Dosa, was missing. To make matters worse, the accompanying Sambar was plain awful. 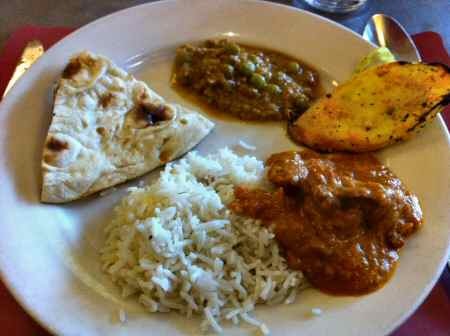 With just one small piece of Tomato, Jackson Diner's Sambar tasted like watery, sour dal. It did not come packed with the fine aroma and taste of South Indian Sambar that I am so used to. Needless to say, I did not enjoy the burnt Masala Dosa one bit. 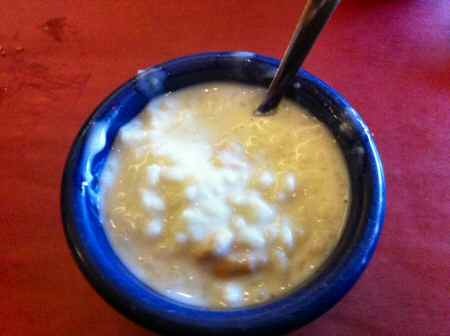 Though weekday lunch buffet was priced at $10.95, it included just one dessert - Rice Pudding. Rice Pudding was cold, included some cashew nuts and was slightly low on sweetness. While the temperature of Rice Pudding was just right, I would have enjoyed it more if it were it a tad sweeter. To serve just one dessert for a $10.95 buffet is nothing short of a rip-off. I did not encounter a single smiling face among the staff of Jackson Diner. Every waiter had the look of a disinherited son, dejectedly returing from his father's funeral and the subsequent reading of the old man's will. 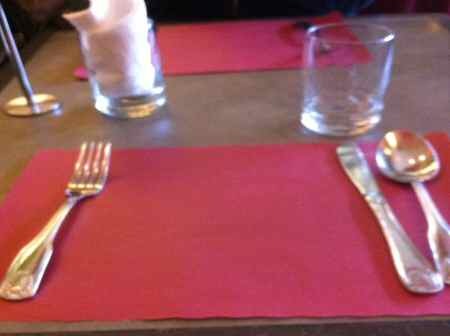 When I walked in around 1:30PM, the restaurant had many empty tables. As you enter the restaurant, you have tables upfront, buffet station on the left by the glass window and kitchen at the rear. The square dining hall was spacious and clean. An unsmiling, stern-faced middle-aged waiter showed me to a table promptly. My table was clean and the silver neatly placed on a table mat. Keeping the silver on a table mat is a good hygiene practice. The table included clean water glasses along with a plastic water jug and paper napkins. Lunch buffet station included three separate stalls. The first stall included Appetizers, Chutneys and Salad. The second stall was located by the glass window facing 74th St and included Chicken, Meat and Vegetarian Entrees. The third stall was a Dosa station with a person preparing the dosa fresh. Dining plates were clean. Used plates were not removed promptly and allowed to stay on the table for far too long. The small plastic dessert cups were dirty and I had to sort through several cups before locating a relatively clean cup. Also, the Dosa station was a little chaotic making people to stand there to pick up their dosas. In other Jackson Heights Indian restaurants on 74th St, Dosa is served at the table. You do not have to wait in queque for your dosa. All in all, my lunch buffet experience at Jackson Diner was extremely underwhelming. The restaurant seems to be coasting on its reputation and the desperate prayer that its patrons are clueless about real Indian cuisine.